Home ARCHIVED NEWS 2017 Baby season is here! We have finally entered baby season and are busy bottle feeding and keeping babies warm. 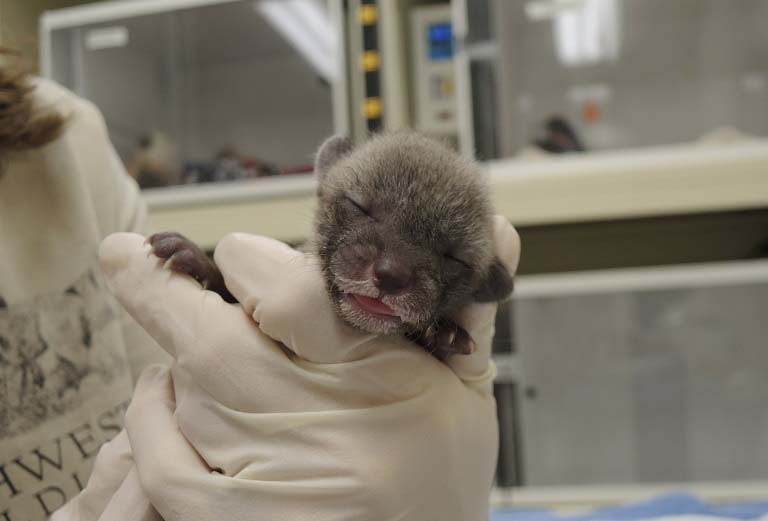 The first baby to come in was an orphaned gray fox. The main goal with all babies is to get them back to the wild when they are big enough. – Bobcats and Coyotes-if you happen to see bobcats, coyotes, raccoons, foxes, or other native mammal babies alone, please do not disturb them unless they are directly in danger . Typically, the mother is not far away but will often not approach if people are nearby. Please monitor the den from far away to see if the mother returns. Many times, the mother will leave for 6-8 hours at a time to hunt and gather food for her young. – Deer-Don’t pick up, move, or approach fawns who appear alone. A mother deer will typically leave their young in what they believe to be a safe place while she forages for food, often for many hours at a time. The baby knows to stay put and not leave. The mother is always close by. Only contact a rescue group if you have not seen the mother in 24-48 hours or if the fawn appears sickly or injured. – Birds-please do not pick up baby birds. If you must touch a baby bird, please put it back in the nest. One of the most widely circulated myths is that a bird mom will reject her young if you touch them. This is not true. – Rabbits-baby rabbits might appear helpless and fragile but in reality they quickly develop and will forage on their own. A rabbit mom will only visit her babies twice per day, at dawn and dusk. It’s the best way to keep predators away and her babies safe.Unattended baby rabbits are usually not orphaned. If you come across a wild animal baby and think it might be orphaned, please call us first! We have a hotline you can call to ask questions or alert us to a wild animal in need.